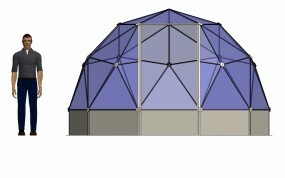 There are five domes in our glasshouse range, suitable for a variety of facilities and uses. The natural strength and aerodynamics of the geodesic design, ensure they last and remain robust even in extreme weather conditions. Built with mill finished aluminium and single glazed 4mm toughened glass, they come with base level ventilation, mechanical window winder units and a secure conservatory-style door. Silicone sealant and UV stable plastic glazing strips provide a weather-tight seal. All domes come with a white (external) and silver (internal) finish as standard and can be power coated in green, grey or brown if desired. The glass panels can be swapped for other 4mm panels to suit your intended use. Our commercial glasshouse range, from 3.6m to 10.1m diameter, and for the SOLARDOME® Haven, Retreat and Sanctuary models there is the option to have an integrated base. Find out more about the options and accessories available. Need a temperature controlled space? If you need a temperature controlled space to use your dome all year round, then our SOLARDOME® PRO system might be more suitable. The SOLARDOME® PRO architectural system is perfect for larger dome projects from 7.2m to 25m diameter, and can be single or double glazed or have a combination of cladding materials. If you have a any questions regarding our domes, or require further help and advice please call us or visit our Support pages. The SOLARDOME® Pod makes an ideal quality greenhouse and a wonderful outdoor room for getting hands on with nature. 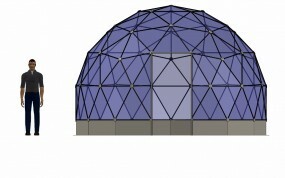 The SOLARDOME® Haven is regularly chosen by community projects and care facilities as a greenhouse or patient area. The SOLARDOME® Retreat provides a large room and is ideal for community projects, additional B&B or hotel facilities or entertainment venues. 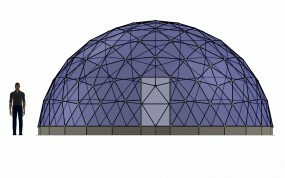 The SOLARDOME® Sanctuary is a large dome and creates an ideal environment for a café, hotel spa or dementia garden. 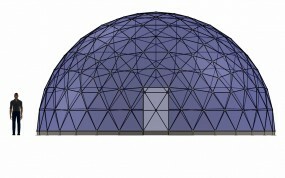 The SOLARDOME® Paradise is an ideal dome for a large community centre, visitor attraction or tropical biome project. Alternatively, for large commercial dome projects greater than 10m diameter we have our SOLARDOME® PRO architectural system. 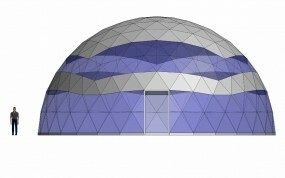 Ideal for freestanding dome projects, such as a spa complex, visitor facility or restaurant. You will need to liaise with your local planning authority to see whether planning is required in the proposed location. Building Controls are generally not required for the two smaller models. 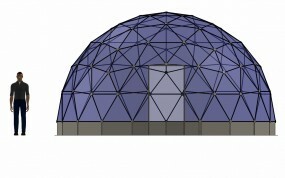 For the larger domes it depends on usage so it is best to check with the local building control department. We can provide you with a full technical document you can use for Building Controls. With its distinctive shape and unique micro-climate, what a great complement the Solardome® glasshouse is to the landscape!